This article provides in depth fundamental analysis of Sutlej Textiles and Industries Ltd, an Indian company focused on the production of Melange, Modal, Lyocell and Tencel yarns and home textiles segment. Increase in Production Capacity: Production capacity increased from 155,456 spindles in 2005 to 377,688 spindles in 2016 and 416,616 spindles in 2017. Sales price remains almost constant from 200(2011-12) to Rs.206 in 2016. Sales increased from Rs.466 crores in 2006 to 2,271 crores in 2016. Net Profit increased from Rs.21 crore to Rs.143 crore in the same period. NPM improved from 4.50 to 6% in 2016.
Dividend amount increased from Rs.5 crore to Rs.21 crore in 2016. Total retained profits of last 10 years 569 crore, the total increase in Market cap Rs.120 crore to Rs.1,449 crores i.e. increase of 1,329 crores. 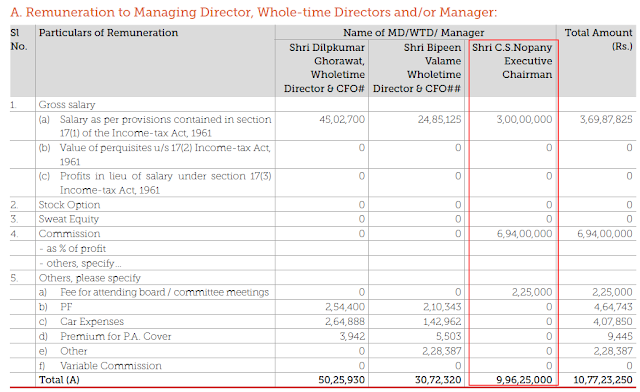 Management succession plans: Salary of CS Nopany in 2016 is 6.88 crores against NP of Rs.143 crores i.e. 4.81%. Project execution skill is good. Consistent growth in dividend payment is good. Govt influence: No govt influence. I could not calculate the self-sustainable growth rate. I want your analysis of the company for keeping the company in my portfolio for the long term. Also, advise whether it can be exchanged with any other company. Thanks for sharing the analysis of Sutlej Textiles and Industries Ltd with us! Let us first try to analyse the past financial performance of Sutlej Textiles and Industries Ltd. 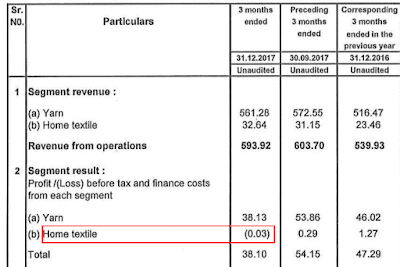 Looking at the financial performance of Sutlej Textiles and Industries Ltd for past 10 years (FY2008-17), an investor would notice that the company has been growing its sales at a moderate pace of 10-12% year on year. 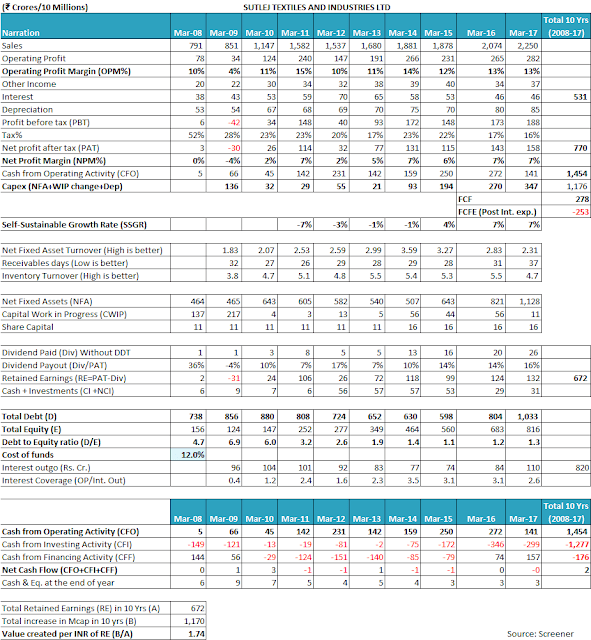 However, this sales growth has been associated with fluctuating profitability margins. The operating profit margin (OPM) of the company has been varying from 4% in FY2009 to 15% in FY2011 and has declined to 13% in FY2017. Similarly, the net profit margin (NPM) of the company has been varying from net losses in FY2009 to 7% in multiple years including FY2017. The varying profit margins of the company over the years indicate that the company operates into a difficult and highly competitive business environment where at times, it finds it difficult to pass on the rising costs (including raw material costs and other inputs costs) to the end customers. Different credit rating agencies have highlighted this aspect of the susceptibility of the profit margins of the company in their report over the years. Apart from the changes in the raw material prices and other inputs costs, the changes in the govt policies and incentives also affect the profit margins. During FY2018, especially the Q3 (Oct-Dec 2017) quarter, the company witnessed a steep decline in its profit margin because of reduction in the export incentives provided by the govt. The company has to use its manufacturing facilities for third-party contracts/job works at prices, which barely cover the variable costs. The management has also accepted the tough nature of business in the industry and it has at times, acknowledged that the industry conditions behave so tough that even reporting a positive profit is commendable. However, when an investor compares the profit margin of Sutlej Textiles and Industries Ltd with its peers, then she notices that many of the peers of the company have significantly higher profit margins. It indicates that overall, Sutlej has a lot to improve in terms of its competitiveness, product mix and branding in order to match the profit margins of some of the better performers in the industry. Therefore, in light of the tough and competitive business environment and the changing policy situations faced by the company, it becomes essential that an investor keep a close watch on the profit margins of the company going ahead. The company has communicated to the shareholders that because of the incentives, the tax rate of the company is expected to be at the level of MAT (minimum alternative tax). While analysing the net fixed asset turnover (NFAT) of the company over the year, an investor would notice that the company witnessed an improving NFAT until FY2014 when it had the highest NFAT of 3.59. However, since FY2014, the NFAT of the company is on a decline. In FY2017, the company had the NFAT of 2.31. The decline in the NFAT in recent years is because of significant capital expenditure of about ₹900 cr done by the company during FY2014-17 to increase its manufacturing capacity in both the spindles as well as home textiles segment. However, in case of Sutlej Textiles and Industries Ltd, the company is yet to utilize some of its capacities in the optimal manner, which as per the company is to use it for its own market products rather than for job work. As a result, the company is not able to get the true benefit from the added capacities leading to lower sales revenue and hence, the lower NFAT. An investor would notice that the receivables days and the inventory turnover level (ITR) of the company have been range bound over last decade (FY2008-17). The receivables days have been in the range of 27-31 days. The receivables days in FY2017 have increased to 31 days, which is on the account of different accounting treatment needed for trade receivables because of new accounting standards (IndAS). Under IndAS, the company needs to show the receivables, which have been discounted from the banks in its balance sheet instead of contingent liabilities. These receivables, where the company has taken a loan from the banks under bill discounting and as a result, the receivables are to be received by the bank are now shown under trade receivables in the balance sheet whereas earlier such receivables were removed from the “trade receivables” and shown under contingent liabilities. Over the years, Sutlej Textiles and Industries Ltd has had its inventory turnover ratio (ITR) within the range of 4.7 to 5.5 indicating that the company has been able to keep its inventory utilization efficiency in check. Therefore, an investor would notice that the company has been able to control its inventory and receivables over the years and as a result has been able to prevent a significant amount of cash from being stuck in the working capital. Therefore, an investor would notice that the company has been able to convert its profits into cash flow from operations. Over FY2008-17, the company reported a cumulative profit after tax (cPAT) of ₹770 cr whereas during the same period it reported cumulative cash flow from operations (cCFO) of ₹1,454 cr. An investor may read the following article to understand the factors that influence the conversion of PAT into CFO. The article will illustrate the parameters that lead to a company reporting lower CFO than PAT and vice versa. An investor would notice that Sutlej Textiles and Industries Ltd has witnessed an SSGR of -7% to +7% whereas the company has been growing at a rate of 10-12% over the years. As a result, it seems that the company is attempting to grow at a pace, which is higher than what the internal business cash generation is able to sustain. As a result, the company has resorted to raising external funds to meet its growth requirements as the debt has increased from ₹738 cr in FY2008 to ₹1,033 cr in FY2017. 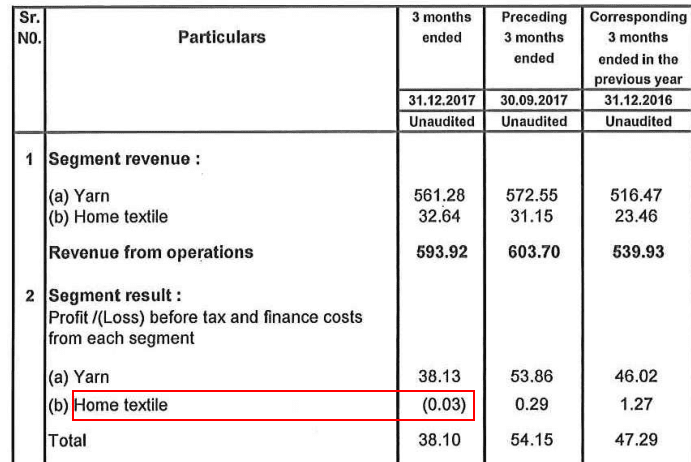 While analysing the free cash flow (FCF) position of the company, an investor notices that over FY2008-17, Sutlej Textiles and Industries Ltd generated a total cash flow from operations (CFO) of ₹1,454 cr and it did a capex of ₹1,176 cr over the years to grow its sales from ₹791 cr in FY2008 to ₹2,250 cr in FY2017. However, as mentioned above, the company had a sustained high level of debt during the last decade and as a result, it had an interest expense of ₹531 cr over FY2008-17. Therefore, post the capital expenditure and the interest payment, the company had a cash deficit of ₹253 cr (1454 – 1176 – 531). Moreover, the company has paid out dividends over these years and has also made investments including ₹50 cr invested in the preference shares of The Oudh Sugar Mills Ltd in FY2012. The company has met the cash shortfall by raising debt from different lenders and as a result, the total debt of the company has increased from ₹738 cr in FY2008 to ₹1,033 cr in FY2017. 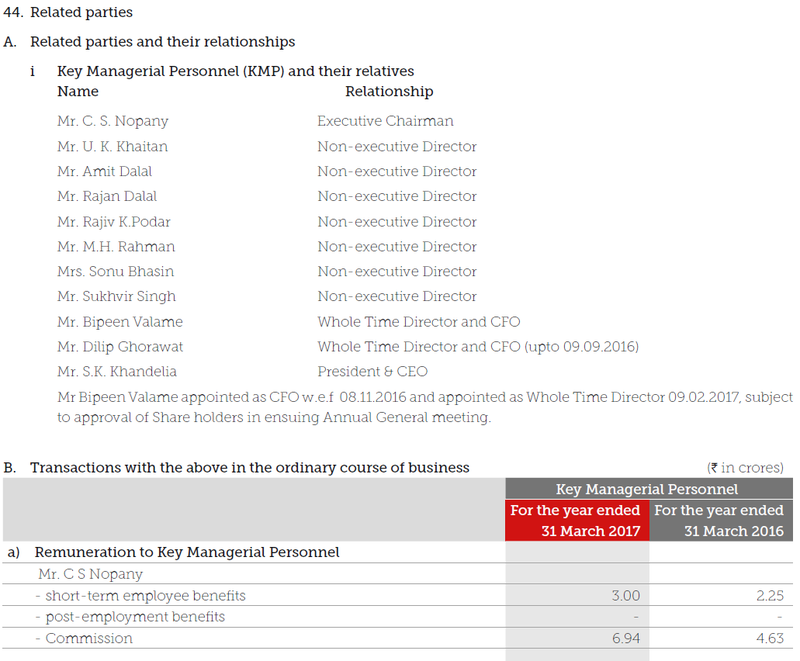 It seems that recently these companies have witnessed one-step of management succession as a part division of family business of late Mr. K.K. Birla. Currently, Mr. C.S. Nopany who is about 51 years of age is the Executive Chairman. Going ahead investors should focus on the future management succession-planning put in place by the company. 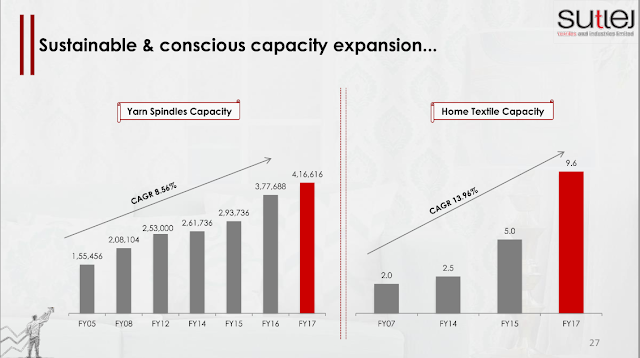 The company has added to the existing manufacturing capacities in the past in both the business segments of the spindles and home textiles. The capacity additions have been a mix of inorganic measures (acquisition of Birla Textile Mill in Baddi) as well as organic measures (addition of capacity at existing plants). The company has been taking shareholders’ approval to pay a remuneration, which is higher than the ceiling put in the Act. As per our own benchmark, which compares the promoters’ remuneration with the reported PAT, the FY2017 remuneration of the Executive Chairman ₹9.96 cr, which is 6.3% of the PAT (₹158 cr) for FY2017, is on the higher side. Investors should keep a close watch on the promoters’ remuneration going ahead. As mentioned in the new article published in the Business Line (Nopanys to ring-fence K.K. Birla legacy; to up stake in Upper Ganges, Oudh Sugar), the promoters of Sutlej Textiles and Industries Ltd have inherited two sugar mills: Upper Ganges Sugar & Industries Ltd and Oudh Sugar Mills Ltd as part of the division of business of late Mr. K.K. Birla. Therefore, it seems that the promoters of Sutlej Textiles and Industries Ltd have significant influence over Upper Ganges Sugar & Industries Ltd, Oudh Sugar Mills Ltd (merged into Avadh Sugar & Energy Ltd). 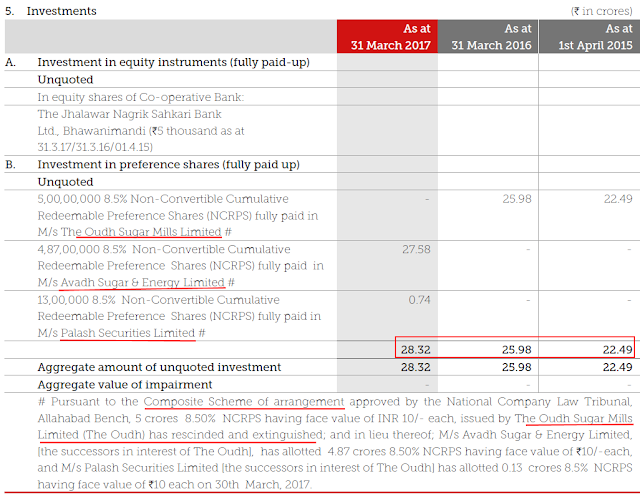 However, none of these names appears in the FY2017 annual report of Sutlej Textiles and Industries Ltd under the related party section as the enterprises over which promoters exercise significant control/influence. It might be that due to some legal business structuring/clauses these companies may not fall in the classification of related parties or it might be an omission on part of the company. Therefore, investors may seek clarification from the company about the same. 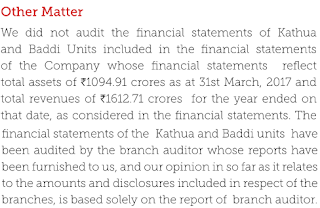 While analysing the annual reports of the company, an investor would note that Sutlej Textiles and Industries Ltd has been supporting promoter group companies Oudh Sugar Mills Ltd and Upper Ganges Sugar & Industries Ltd over the years. Oudh Sugar Mills Ltd was merged into Avadh Sugar & Energy Ltd. As a result, Avadh Sugar & Energy Ltd and M/s Palash Securities Ltd have issued preference shares to Sutlej Textiles and Industries Ltd in lieu of its investments in Oudh Sugar Mills Ltd.
As part of IndAS accounting, Sutlej Textiles and Industries Ltd has to disclose the fair value of the preference shares in the annual report of FY2017. Therefore, while analysing the FY2017 annual report, an investor notices that the value of the initial investment of ₹50 cr along with the due coupon for the interim period has declined in value significantly. The fair value of this investment in FY2015 was ₹22.49 cr, which has increased to ₹28.32 cr in FY2017. The decision of Sutlej Textiles and Industries Ltd to invest in Oudh Sugar Mills Ltd might be akin to supporting promoter group entities using the resources of the company where the investment has turned into losses. 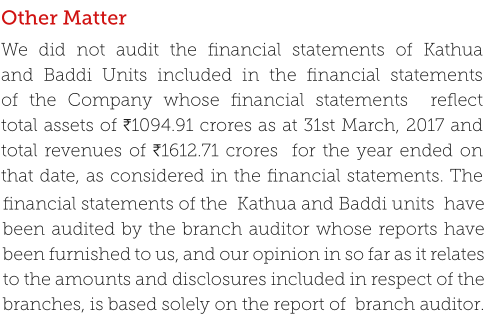 The investor would note that Upper Ganges Sugar & Industries Ltd repaid the loan within the financial year; therefore, there was no loan outstanding at the end of FY2016. 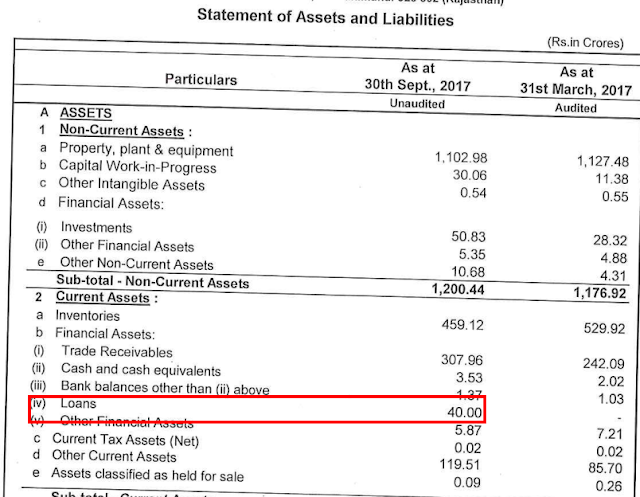 Moreover, if an investor reads the summary balance sheet presented by Sutlej Textiles and Industries Ltd along with H1-FY2018 results, then she would notice that a loan of ₹40 cr is again outstanding in the books of the company at September 30, 2017. As the details of the counterparty to this ₹40 cr loan outstanding at September 30, 2017, is not disclosed in the Ltd information in the quarterly results, therefore, it cannot be said with certainty whether this loan is to Upper Ganges Sugar & Industries Ltd (or to Avadh Sugar & Energy Ltd in which it has been merged). Investors may seek clarification from Sutlej Textiles and Industries Ltd about this counterparty. Therefore, it might be one of the scenarios that Sutlej Textiles and Industries Ltd has decided to continuously support Upper Ganges Sugar & Industries Ltd to the extent of ₹40 cr. As a result, it might advance the loan at the start of the financial year and take repayment before the end of the financial year. Therefore, the loan is not outstanding at the end of the financial year. This can be one of the scenarios. Investors may seek clarification from the company about this loan as it may also tantamount to supporting promoter group entities using the resources of the company. Investors may seek details of the branch auditor from the company to do their own assessment of the branch auditor who has audited the key manufacturing units. 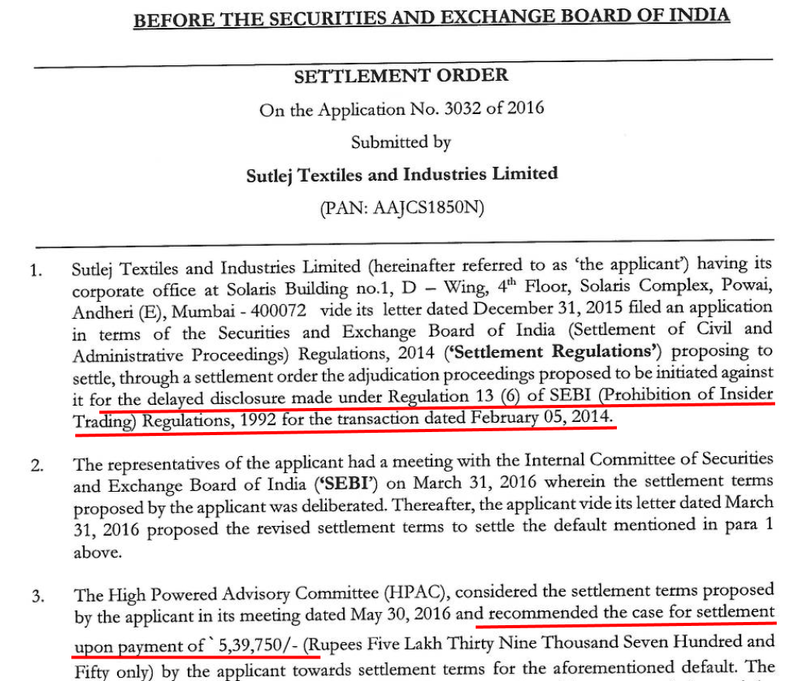 SEBI order on non-compliance of insider trading guidelines: The Company paid ₹5.39 lac as a settlement for the inquiry initiated by SEBI for the delay in disclosure of insider trades by the company. 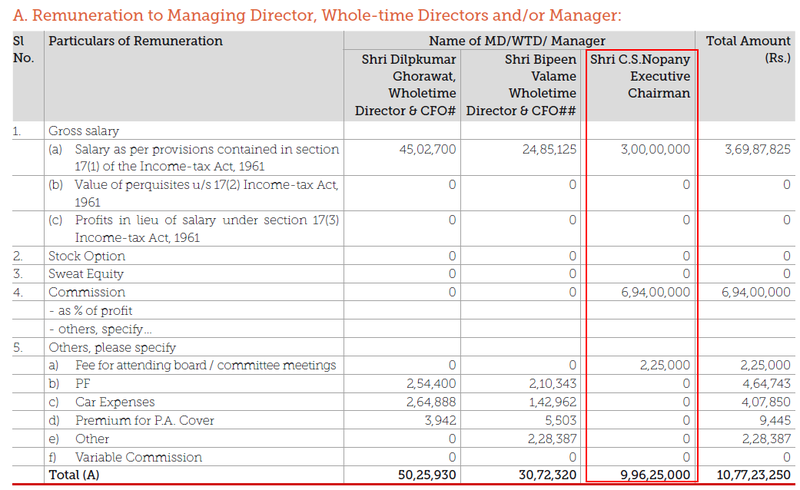 Delay in appointment of women director: In FY2015 annual report, the company secretary has highlighted as part of its secretarial audit report, page 83 that the company did not appoint women director on its board in time as per the statutory requirements. Nonpayment of interest due to lenders on time: An investor would notice that every year at March 31, the company has an interest amount of about ₹3-4 cr, which is due for payment, but has not been paid by the company. Looking at the financial position of the company as well as its credit rating of AA, it does not look like that the company would be facing any financial crunch to pay these interest payments on time when they became due. However, it is advised that investors should seek clarifications from the company as well as the credit rating agencies about these delays in interest payments. Investors may seek clarifications from the company on the steps taken by the company in order to ensure that it complies with all the required regulations. Investors would notice that one of the companies classified as promoters of the company, Uttar Pradesh Trading Co. Ltd has pledged 3,000,000 shares to lenders. It might be that the promoter entity has raised funds from lenders by providing its shares in Sutlej Textiles and Industries Ltd as a security in order to support other promoter group entities/personal usage. An investor should monitor the changes in the level of pledging of promoters shareholding going ahead. Currently (April 25, 2018), Sutlej Textiles and Industries Ltd is available at a price to earnings (P/E) ratio of about 11.5 based on trailing 12 months earnings, which offers a small margin of safety in the purchase price as described by Benjamin Graham in his book The Intelligent Investor. Overall, Sutlej Textiles and Industries Ltd seems to be a company, which has been growing at a moderate pace of 10-12% over the last decade in an industry, which is marked by high competition and pricing pressures. As a result, the company has been facing fluctuating profit margins, as it is not able to pass on the increases in the raw material and other inputs costs to its customers in time. The company is also impacted by govt policies and as a result, the recent reduction in export incentives by the govt has led to a reduction in its profitability. The company has been able to increase its manufacturing capability consistently both by organic plant capacity creation as well as by inorganic acquisition where it acquired another Birla group textile company. However, recently, the company is not able to utilize entire capacity for its own market and has to run about half of the capacity as job work for third parties where it is not able to make any profits. As a result, in the recent most quarter (Oct-Dec 2017), the home textiles division of the company reported losses. The company operates in a capital-intensive business, where it is not able to meet its funds requirement for capital expenditure from the cash generation from the business operations. As a result, the company has relied on debt to meet its growth requirements. The company has been supporting different promoter group companies by way of loan and investments in preferred shares. Some of these investments have witnessed a decline in value indicating a loss to the shareholders of the company. It seems that the promoters are taking home a remuneration, which is higher than the statutory limits and as a result, the company has to take approval of shareholders in the AGM to pay the higher remuneration to the promoters. There are many aspects where investors may seek clarifications from the company like delays in interest payments to lenders, non-classification of promoters’ group companies as related parties, loan to one such promoter group company etc. An investor may seek clarification from the company about the opinion of secretarial auditor about the scope of improvement in the compliance to norms, pledging of promoters shareholding, details of branch auditors who have audited two key manufacturing units of the company etc. Investors should monitor the profit margins of the company along with debt levels, promoters’ remuneration & pledge levels, compliance issues and investments/loans to promoters’ group companies. These are our views about Sutlej Textiles and Industries Ltd. However, investors should do their own analysis before taking any investment related decision about the company.